Chocolate Nut Fudge Cake recipe by Miss Tariq at DesiRecipes.com. Beat butter & brown sugar till light & fluffy. Add in vanilla essence, eggs one at a time & beat well after each addition. Fold in the sieved mixture of flou, cocoa & baking powder along with melted chocolate, nuts & milk. Pour this mixture in a greased 8 inch pan. Bake in a preheated oven at mark 4 or 180 degrees for 3540 mins. Remove & cool the cake. 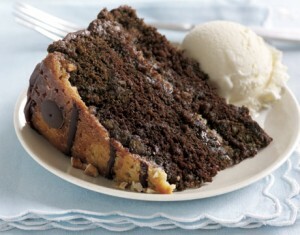 Cut the cake in half & apply the prepared chocolate fudge icing & sandwich the cake. Decorate the cake with fudge icing. In a saucepan combine together cream, vanilla, cooking chocolate, cocoa powder & butter. Cook stirring till chocolate melts. Add in sieved icing sugar, mix well. Keep in freezer till set & hard. Take out after an hour & beat well till fluffy.